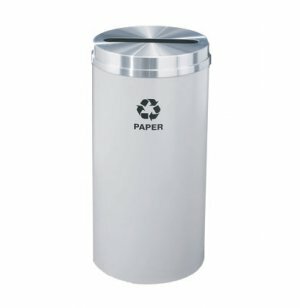 Glaro introduces a line of recycling containers that is attractive, durable, and environmentally friendly. 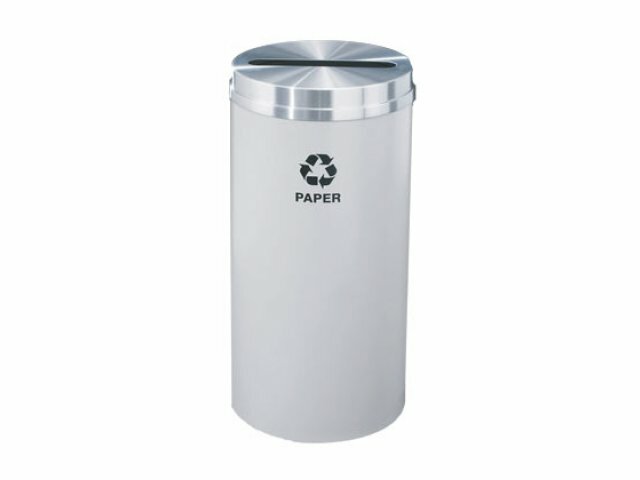 These containers are comprised of a high percentage of recycled content and are themselves recyclable. Their double metal, fire-safe, tarnish-proof construction guarantees they will last for years. Additionally, Glaro offers you a wide choice of colors, while each container also comes with its own silk screened recycling logo/wording and can be further customized with your own corporate logo or message. Glaro has been manufacturing distinctive accessories for schools and offices since 1945. Beautifully designed wall-mounted and mobile coat racks, shelf racks, umbrella holders and recycling cans are just some of their top-quality products. Disposal Opening: 2" x 12". Double metal, fire-safe all weather construction. Galvanized steel removable inner container with "easy-lift out" handle. Non-corrosive aluminum bottoms on inner and outer containers. Specialized heavy gauge seamless hand-spun aluminum tops with customized openings. Satin aluminum and all weather tarnish-proof satin brass metal finishes. Available in a range of designer colors. Clear protective powder coat finish. Professionally silk screened recycling logos/wording included. Custom silk screened corporate logos and messages available; Call for pricing.